Anti-Semitic graffiti scrawled across the forehead of a Holocaust survivor featured on a lawn sign in North York is "cowardly and horrific," a national Jewish organization claims. Anti-Semitic graffiti scrawled across a sign promoting Holocaust education in North York is "cowardly and horrific," a national Jewish organization claims. 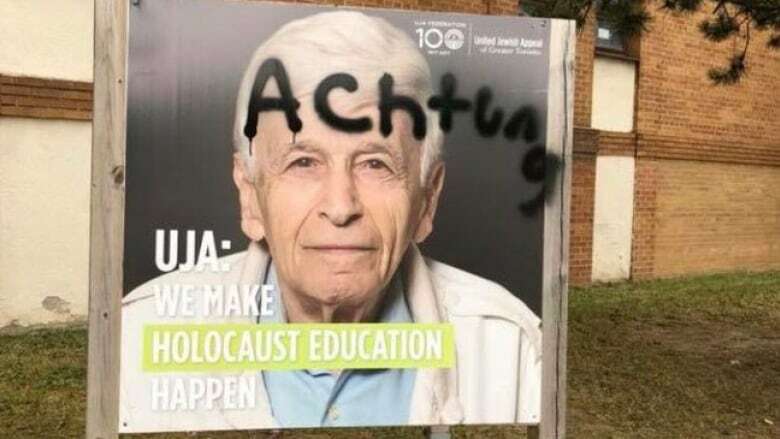 The word, "achtung" appeared spray-painted in black across the forehead of Holocaust survivor Max Eisen outside Beth Jacob Synagogue, near Dufferin Street and Finch Avenue West, on Saturday, United Jewish Appeal (UJA) Federation of Greater Toronto said in a statement. Achtung means attention in German. It was used by Nazi soldiers during the Second World War. "We were deeply disturbed to learn of this incident," Sara Lefton, vice-president of philanthropy for the UJA Federation, said in a statement Sunday. The hateful message was found on Tisha B'Av, a Jewish day of mourning that commemorates the destruction of the First and Second Temples in Jerusalem. The day is auspicious among religious Jews, as it is considered the saddest in the Jewish calendar. 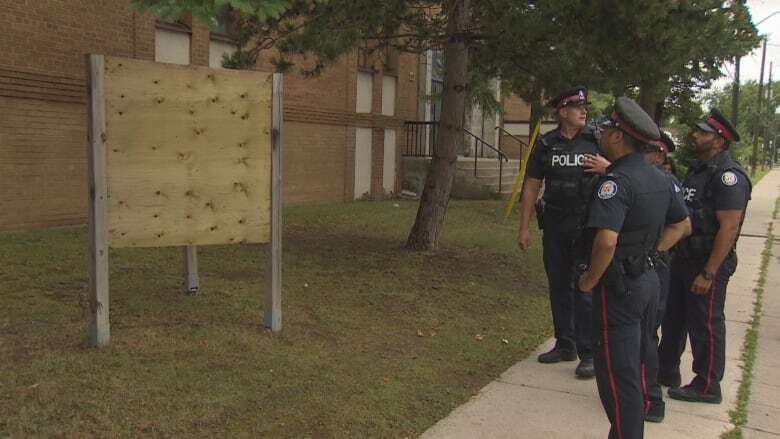 Toronto police have launched an investigation into the incident, and while officers initially deemed it suspicious, they are now investigating the incident as a hate crime. Spokesperson Gary Long said earlier that the vandalism was "not a hate crime by definition" because officers had no indication the word was directed at a particular group of people. By Sunday evening, police said the offence was covered under what they perceive to be a hate crime. The most disturbing part for many Jewish officials in Toronto, was what they say is a brazen attack on a prolific Holocaust educator in Canada. Eisen, 89, survived Aushwitz and testified against two of the camp's former SS guards that ultimately led to their war crime convictions in 2016. Lefton maintained that the vandalism unfairly targeted Jews and sought to undermine their education efforts. "Every hate crime reminds us that we must strengthen our efforts to educate the next generation about the dangers of intolerance and hate," she said in a statement, noting the incident has reaffirmed the UJA Federation's commitment to Holocaust education. Other Jewish groups spoke out in solidarity with the UJA Federation. Noah Shack, vice president of the Centre for Israel and Jewish Affairs (CIJA), said the incident has "really shaken people up," adding that the Jewish community is "resilient" and will continue to work to stamp out hatred. "This type of hatred has no place in our city," said Mayor John Tory. He condemned the incident on Sunday, calling it "unacceptable" when he met with Jewish officials, Rabbi Dov Schochet and Coun. James Pasternak, whose ward includes the Bathurst Manor neighbourhood. "It was a very special day on the Jewish calendar, so it would also lead you to believe that this was someone who had a very particular purpose in mind," he told reporters outside the synagogue. "That's why you have to speak up and just say, 'Hey, this is not going to be apart of the way we're going to live here.'" We know that across the GTA and Canada, the Jewish community is the most frequently targeted minority. That’s why it is so important for all of us to condemn this hatred when we see it in our communities. The defaced sign has since been removed. Tory vowed that police will work hard to find the culprit. Officers plan to watch the synagogue's surveillance camera footage today.